The UCSB campus is ideally situated along the Santa Barbara and Goleta coastline, accessible by Highway 101 that runs north/south through California. View a Google Map. If you are visiting one of the College of Engineering’s departments, please visit the department pages for more specific location and parking information. In general, many engineering buildings and facilities are located in the northeast corner of campus, in the section between Mesa Road and Lagoon Road. View a Google Map of our location to set your own course. From Hwy 101 Northbound: Exit Highway 217 and enter campus via Henley Gate. At the roundabout, veer right to head west on Mesa Road. At the next stoplight, turn left into the Lot 10 parking structure (see map). From Hwy 101 Southbound: Exit Patterson Road and get into the far left turn lane. Turn left over the freeway, then immediately enter the left turn lane at the Highway 217 on-ramp. Veer left on the on-ramp to take Hwy 217 toward Henley Gate. At the roundabout, veer right to head west on Mesa Road. At the next stoplight, turn left into the Lot 10 parking structure (see map). 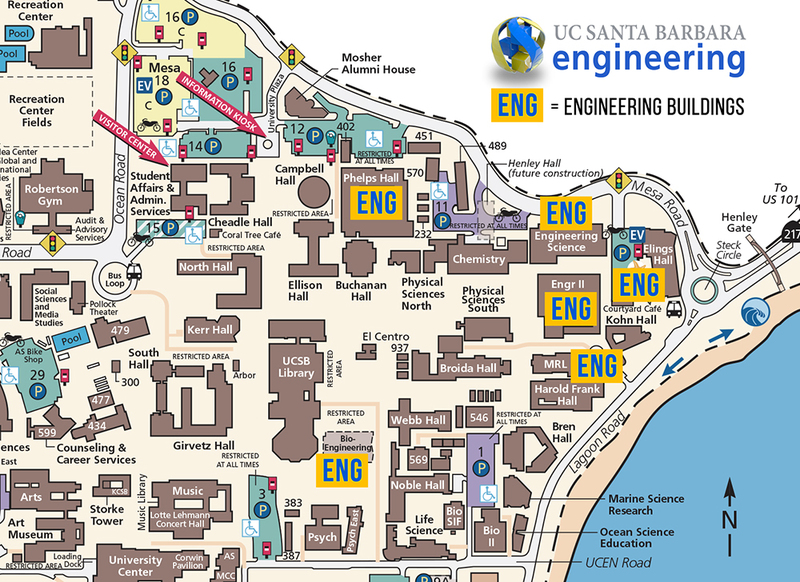 Visitors, please see UCSB’s parking maps. Park only in the stalls labeled "Metered Parking". Parking permits are required 7:30am to midnight, every day of the week. They can be purchased from a permit dispenser located at various levels of the Lot 10 parking structure. Make a note of your space number then visit one of the permit dispensers located in the lot; enter your space number and select the duration of the parking time needed. Pay by cash, Visa, MasterCard, Access Card, or by cell phone (call toll free 1-866-283-8393). Parking permits are not required on Administrative Holidays unless otherwise noted. For questions related to parking, please contact Transportation and Parking Services at tps.ucsb.edu or call 805-893-2346. UCSB College of Engineering administrative offices are located in Harold Frank Hall, in the first floor wing facing Lagoon Road and the Pacific Ocean. Labs, faculty offices, and classrooms are located in several buildings throughout campus. Faculty directory profiles will provide information about faculty office and lab locations. Administrative office location information for each of our departments can be found on their websites.